Fiery labor icon Mother Jones cannot be resting peacefully beneath the crabgrass in the Union Miners’ Cemetery, not far from Springfield, Illinois, where Bruce Rauner, the recently elected Republican governor, has launched an unprecedented attack on organized labor. Rauner, a former private equity fund chairman, made a reported $62 million in 2013, the year before he was elected. Now the Harvard MBA is challenging public and private unions on several fronts—even pushing the state’s municipalities to create “right-to-work zones,” where workers in unionized jobs could opt out of paying union dues. This town-by-town approach is a relatively new idea and may be of dubious legality, but it’s already caused Cook County, where Chicago is situated, to preemptively declare that it won’t go along. Rauner is part of a clique of Midwestern Republican governors challenging unions in a region where behemoths like the United Auto Workers and massive public employee unions covering teachers and other state employees have long dominated. In Wisconsin, Governor Scott Walker diminished the power of the state’s public employee unions in 2011 by pushing through a law that cut their benefits and limited their collective bargaining power. 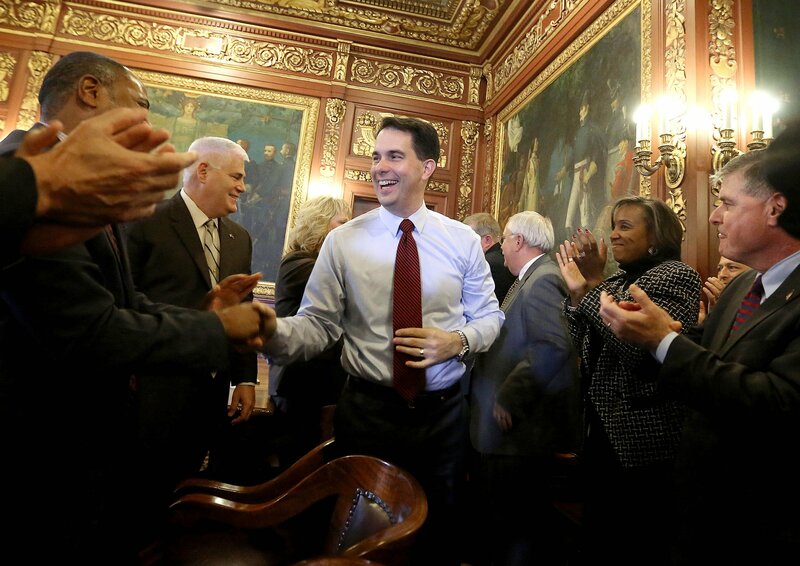 That move, and his survival of a union-led recall effort in 2011, not only propelled Walker into the first tier of Republican presidential candidates; it also emboldened conservative governors and legislators around the Great Lakes. Governor Rick Snyder made Michigan a right-to-work state in 2012, and Indiana’s governor at the time, Mitch Daniels, followed suit, creating a bloc of anti-union states in what was once a labor stronghold. Their latest victory: Last month, Walker signed a law making Wisconsin the nation’s 25th right-to-work state. Once in office, Rauner issued a “Turnaround Agenda” that begins with this premise: “Government union leaders are funding politicians who negotiate their pay and benefits.” To put an end to that, Rauner issued an executive order challenging collective bargaining agreements with state employees and urged municipalities and counties to create their right-to-work zones. Rauner frames the issue as one of freedom and local control. The governor says he wants Illinois communities to decide whether “their businesses should be subject to forced unionism or employee choice.” Forced unionism is a familiar phrase among opponents of collective bargaining, but it’s also a misleading one. If a majority of workers vote to form a union, then it’s customary for workers to be compelled to pay dues as a price for being in a union. Those who don’t want to join the union are required to pay something so they aren’t getting a free ride. By giving workers the prerogative not to pay union dues, right-to-work laws undercut the power of unions. Rauner’s efforts come amid a long-term, oft-noted decline in union membership from about 35 percent of the workforce in the 1950s to just over 10 percent today. But while many unions, especially those in manufacturing, have hemorrhaged members, those representing public employees have done well, thanks to their protected status. That has changed, however, as cash-strapped municipalities and states have started to look at cutting pensions and contracts to balance budgets. Those conversations haven’t dissuaded Republican governors and even some Democratic mayors to take on AFSCME. While state and local governments always want to save money in contracts with municipal employees, they have even more incentive to do so now. The national economy is reviving, but state and local coffers are still recovering from the Great Recession, and politicians are negotiating harder. Democratic mayors like Emanuel in Chicago and former mayor Chuck Reed of San Jose, California, tried pension reform, despite howls of outrage. Emanuel’s closing of nearly 50 mostly minority schools to save money drew the wrath of the teachers’ union, and its disapproval is one of the factors that forced him into a runoff election. Mark McKinnon: Do We Still Need Unions? No. 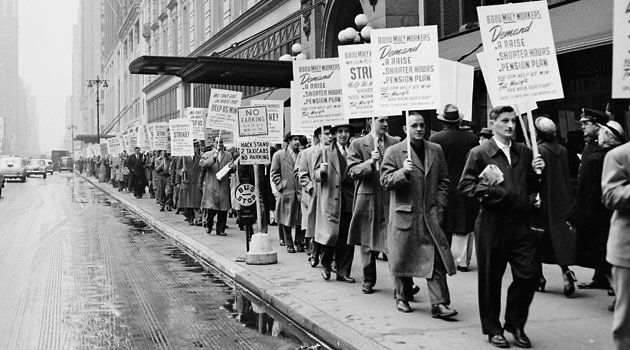 This struggle over collective bargaining isn’t new. Business vs. labor was a defining, often violent, battle of the late 19th and early 20th centuries. 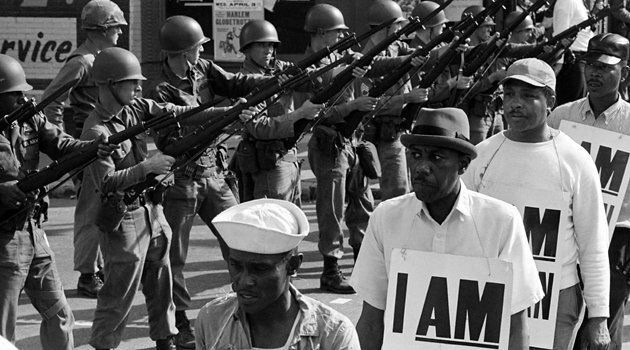 Strikes, riots and deaths were commonplace. (Mother Jones is buried alongside miners killed fighting owners in the late 19th century for better conditions and pay.) A Texas oil lobbyist in the 1930s dreamed up the “right-to-work” law to keep Southern blacks from organizing on the oil fields. Texas became the first right to work state in 1943. Michigan became the 24th in 2012. The union bashing could also be a preemptive strike should any 2016 Democratic candidates play the class-war card in an era of historic income inequality. A massively funded conservative industrial complex aids the likes of governors Rauner and Walker in their union busting. One of the most effective groups challenging organized labor is the American Legislative Exchange Council (ALEC), which wrote Michigan’s right-to-work law and has created a task force aimed at city and county public employees. 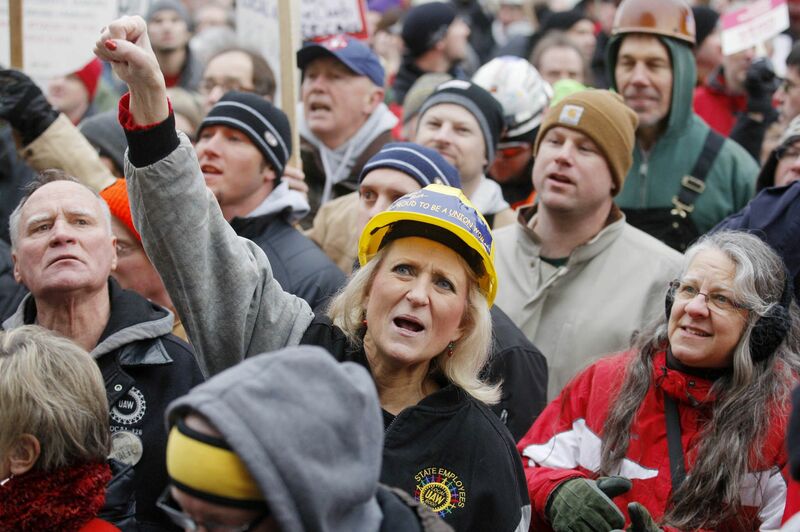 The ALEC’s right-to-work laws are now in force in 13 Kentucky counties.